We calculate the particular range using VBA. 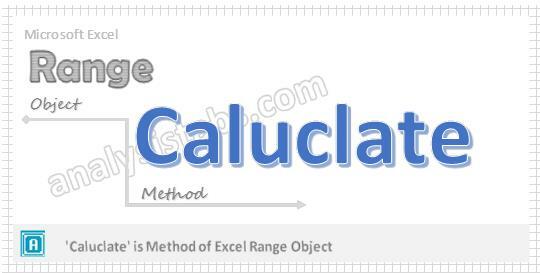 Calculate method in Excel help us to calculate all opened workbooks, specific workbooks, specific worksheets, Ranges, columns or rows. This method will be useful when your Excel Calculation method is set to manual mode. or if you have many formulas in the workbook and want to refresh or recalculate a particular range you can use Range.Calculate method. You can use the calculate method of the range to calculate any range. Here is the simple example to calculate a specific Range. This example will calculate Range “A2:D10” using VBA. Enter some formula at B2 as “=D2” and enter some value at D2. Now you can see the D2 value at B2. Now you can observe that the value at B2 is changed as per D2. Here is the simple example to calculate a specific Columns. This example will calculate the columns “A to D” using VBA. Here is the simple example to calculate a specific rows using VBA. This example will calculate the Rows”1 to 20″ using VBA.